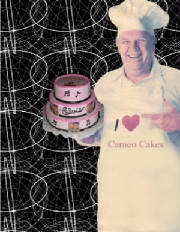 Cameo Cakes has been a family owned business for over 40 years. With the addition of our daughter Amy, We are currently a Third generation bakery and a total of over 70 years experience to produce some of the best tasting cakes in Wichita. Elaine Prather founded Cameo Cakes in 1967 when she began doing cakes out of her home for friends and family. In 1972 she converted a two-car garage behind their house into Wichita 's first specialty cake shop. In 1976 her husband Bob was laid off at a local aircraft plant so Elaine taught him how to bake cakes and soon became the baker which left more time for Elaine to decorate and to take more classes to perfect her decorating skills. In 1979 they opened a 2nd shop in Wichita at Central and Woodlawn in the Normandy Shopping Center . The store did so well they opened a third store on the west side of town. They soon closed the store behind the house and purchased another store on east Douglas . In 1983 the company was turned over to their son Rick and his wife Vicki who was both taught to bake and decorate by Bob and Elaine. Bob passed away in 1993 but occasionally you can still catch Elaine at the store making sure things are still done the way she intended (a great looking cake that taste's as good as it looks). In 2013 our daughter Amy Prather began working for the company after attending college. We are now a 3rd generation cake and cookie shop. We are very excited about 2017 as it will mark a milestone for us as 50 years in business. You can now text us at 316-530-CAKE (2253) OR Please fill in the question or comment box to receive response from us. You must fill out the question or comment section for a response. Below is a piece of our history that my mom recently found. This was the letter from Genral mills (Betty Crocker) when they had bought our recipe for our white cake to package in the 1lb boxs that was sold in the grocery stores. In 1979 that was alot of money and we figured if they wanted it bad enough they could have taken it to a lab and figured it out anyway so why not take the money.They used that reciepe until the late 90's when they started adding pudding in the mix. When Elaine started the business she would say "It's more than just a cake. It's a creation”. She also believed that a cake should taste as good as it looks. We offer a full line of cakes for all occasions. Weddings, Birthday, Baby Showers and Anniversary's for any occasion Cameo Cakes has a cake for you.